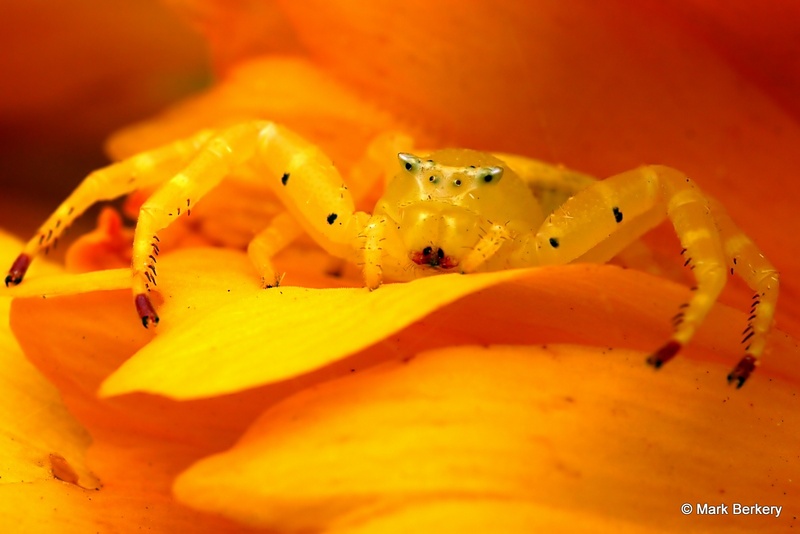 Did you know a spider smiles? Yes, somewhere, inside, below the surface appearance every spider smiles instinctively, psychically. They smile because that is the natural state of things when there is no problem. And a spider never has a problem because a spider doesn’t think and get emotional. Maybe they are on to something there, instinctively. Something we the people can perhaps learn from. Though we think, and it seems often too much, we can get back to the perfect instinct. The instinct that allows no unnecessary thought and right action in the moment, and starts with the simple pure sensation inside, the tingling or pressure in every part of every body. 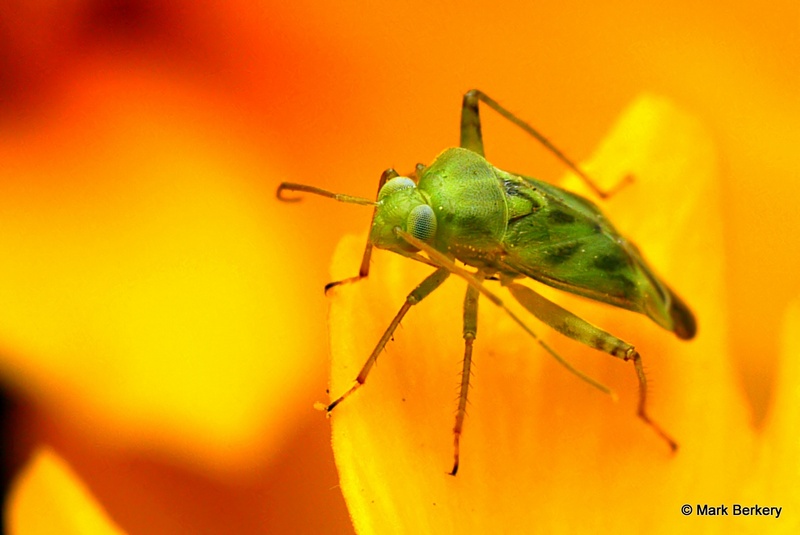 Did you know every insect meditates? Yes, every fly, bee or bug … Except in flight from the spider. And, in death, there is just no more need – for the insects, or we the people. Wowsers! What wonderful images… I can see the pattern on the eye, they are that clear! Well done, you… love this! I welcome the spiders that share my basement apartment, provided that they don’t attach webs to my toothbrush. I call them “mama” in the probably mistaken belief that most of the ones I live with are female. I don’t have other bugs to bug me, thanks I think to my smiling spiders. Spiders are one insect I tolerate in the house, as residents. They do catch anything else that shouldn’t be there, especially the mozzies, and make their webs in out of my way places. Travellers have crossed me in bed at night, and possibly drunk from my glass. Hmmm …. Wonderful to see the colors of summer returned to your garden, Mark. I appreciate your perception of a spider’s smile. An interesting observation. I’m sure I’ll be thinking of it, way too much, now that you have pointed it out. The observed always responds to the observer. 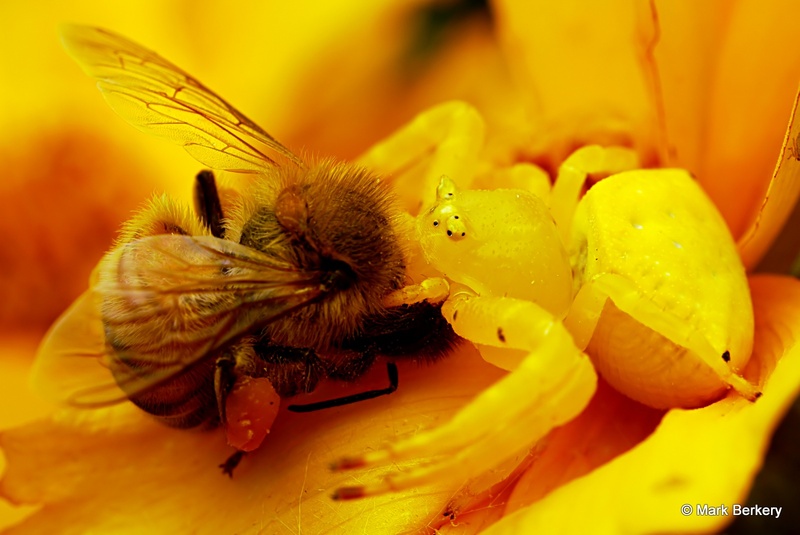 Perhaps you have elicited the spider’s smile through your appreciation of its beauty. We constantly change the world by the way we focus our attention. And we see it differently depending on how much light we allow in the frame. Well, is it the spiders smile, or is it the smile of life inside – with no problem … Yes, we make our reality by what we attend to, or don’t attend to. The weather is getting hot already, thirsty garden hanging in there. And it’s only the beginning, of summer. Fantastic shots. I’m glad I can pop by and see all the types of photos I gave up trying to get. Thanks Lyle. It’s a different class of shooting, isn’t it. And I have control of the light, big advantage when it works. The yellow theme works so well. It does Ken, all on the same flowers in the garden too. 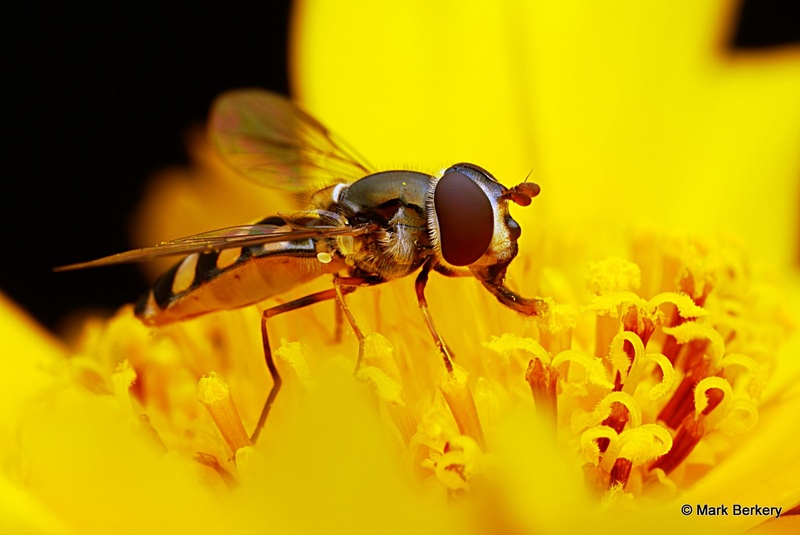 Err, one is a sunflower, the hoverfly. These images are absolutely gorgeous! And I completely agree that we should learn to avoid unnecessary negative thought of all kinds. Life would be a lot happier, more peaceful and with a lot more smiles all around then. There is so much to learn from nature! Thanks Azim. Yes, if there were less negative thinking there would be less negative behaviour – it follows. Nature is without the confusion of mind – apart from the observers – so ‘naturally’ more clearly symbolic. The clearer the mind the more accurate the reflection. Very nice! What is the light source for these pictures? Thanks Dennis. I nearly always use flash, snooted and diffused. Somewhere in this – https://beingmark.com/macro-illustrated/ – there are pix of my setup. I don’t think you need a better system Dennis, but to make the most of what you have – mine is 8yo tech + achromats and developed lighting. Really, it’s the lighting that does the trick. The comments there can be informative too, with some useful links to stuff and technique I use. Stunning images, and an apt reflection on instinctual wisdom. Thanks! Thanks Cate … Instinctual, there’s a word few use.